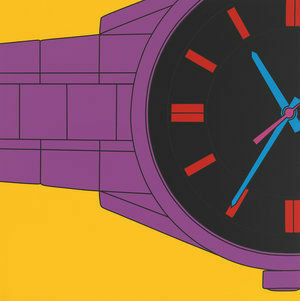 A comprehensive solo exhibition by Michael Craig-Martin is on display at The Gallery at Windsor, Florida from 29 January to 25 April. Present Sense is the largest exhibition dedicated to Craig-Martin ever shown in the US and is the second of three annual exhibitions presented at the gallery in collaboration with the Royal Academy of Art. Curated by Hannah Freedberg, Associate Director at Gagosian Gallery, Present Sense features more than 35 artworks by Craig-Martin including four new artworks: Stiletto, Eye Test, Split Level House and Wireless Headphones. The exhibition extends through and outside the gallery and includes the first outdoor sculptures ever shown at Windsor. Throughout his career Michael Craig-Martin has made everyday objects centre stage using a range of media including painting, sculpture and video. His framing of ordinary objects is a running critique, archive and articulation of contemporary culture, as well as a reflection on visual, mechanical and kinetic languages. His exhibition at The Gallery at Windsor is a detailed, ongoing record of the objects of our time. Present Sense is part of an exhibition series in collaboration with the Royal Academy showcasing the work of Royal Academicians. The featured artists were selected by The Gallery at Windsor’s co-founder and Creative Director Hilary M. Weston, Royal Academy Artistic Director Tim Marlow, and Royal Academy President Christopher Le Brun. The first exhibition in the series featured Grayson Perry RA; the third artist exhibition has yet to be announced and will take place in 2020. Present Sense is at The Gallery at Windsor, 3125 Windsor Boulevard, FL 32963 United States from 29 January until 25 April 2019.